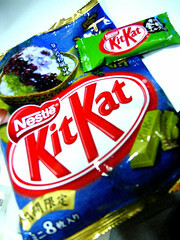 the scent of green bananas: another collective of kitkats. Posted by santos. This entry was posted on 20061103 at 1:51 PM You can skip to the end and leave a response. 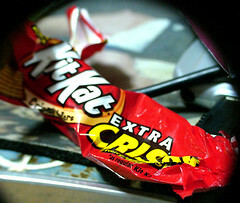 I cannot keep Kitkat bites in my house because I will eat the whole bag. 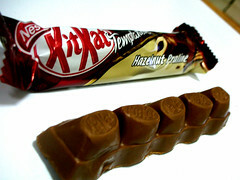 I feel that the Kitkat cookie dough is worth trying though it only comes in the 'chunky' version. I had no idea there were so many Kit Kats. 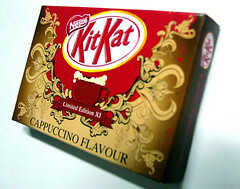 I just go for the Kit Kat Klassic, cuz that's all I've every noticed. I adored Kitkats (and Pocky) growing up. The original, of course. I don't love it as much as I used to, but I admit to having a bar once in a while. Holy Moly - that's a big kitkat roundup. It's tasty work, isn't it! Hey you aren't too bad yourself dollface. Ten years slinging hash at a run down diner got me nothing but debt and a sauced up wife's cutty sark habit to support. So when someone offers you a kitkat you don't ask too many questions. 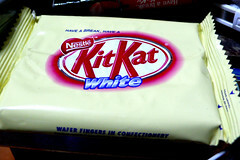 i just came from the grocery and saw "coconut" kitkat..
WOW - so many kitkat versions! where did you get all those kitkats?! 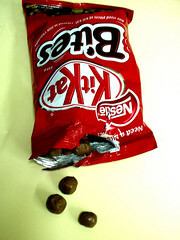 just had 2 mini kitkats for my breakfast. hi leigh, i'm pretty good about not scarfing them down. i don't think i want to try the cookie dough one, but i'm interested in trying the honeycomb one. acornbud, i wish i liked the chocolate better on the american ones. too sweet for me. josefine, there seems to be two chunky versions, one smaller than the other. i think i like the smaller one better! cybele, i don't know how you do it! rainbow, i actually like the coconut one. 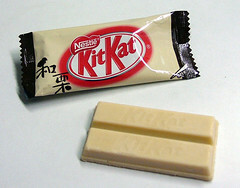 the plain kitkats from the states rank really low for me. just don't like the chocolate. i much prefer the plain ones from australia and the uk. Oh my god, who would've thought that such a simple chocolate coated wafer could have so many different varieties! Here in the states the candy companies are slow to get innovative. 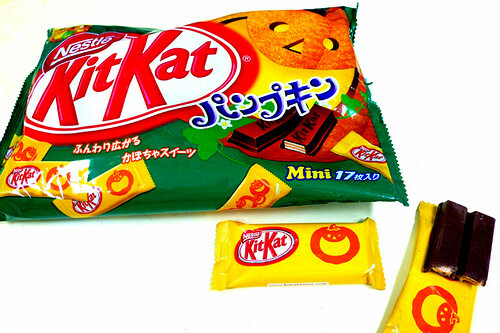 In the last year or so we've seen more variations on familiar themes and the Malt KitKat was one of the strangest. I think it's too malty but Americans don't drink malt like other people do. I opened the package and was almost bowled over by the malty kick. I put it on the table and could still smell it from across the room. 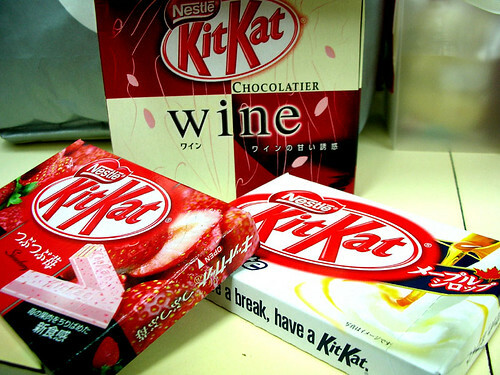 :O Look at all those Kit Kats~! I had no idea there was such a variety of them since I've only ever eaten the regular one I see in candy stores. ^^;;; I am so jealous. A friend of mine brought back a few honeydew kit-kats from HK a few months ago, and I was priveledged enough to be given half of one. The smeel practically filled the (small) room when the wrapper was torn open, and the "chocolate" covering was the colour of rockmelon flesh. I suspect that it was supposed to be coloured white chocolate, but I couldn't tell it apart from edible plastic. Not surprisingly, it was very sweet, but it also had a very strong taste of honeydew. It had that chemical element of artificial flavouring, but it wasn't entirely unpleasant. I will see if I can get ahold of one to send to you, since I've never actually seen them (even in the Asian stores) here in Australia. They just don't know when to stop do they. Although I hope they keep going with the wacky flavours, its always interesting finding a new one. I gave out the American ones this Halloween(in Maine). Other people liked the white ones. I hate the regular ones so I saved the dark chocolate ones for myself. ellie, i think the american versions can only play with the different flavours and colours because the parent company doesn't want to create different moulds for the limited editions. it looks like the european and australian versions come from completely new molds which is really quite cool. swoof, i didn't have quite that experience my milkshake bar, but yes, i suppose it is quite strong for american palates. i really liked it, it reminded me of necco wafers and horlicks tablets. yukari, sometimes you find kitkats at the strangest places. i hear in los angeles the best place to find the limited edition ones are at the 99 cent store! jen, the latest one i'm anticipating has kinoko (soybean powder) and ume (sour plum) in it, so no, they really don't know when to stop! mary jane, i'm with you, the regular ones are just meh. 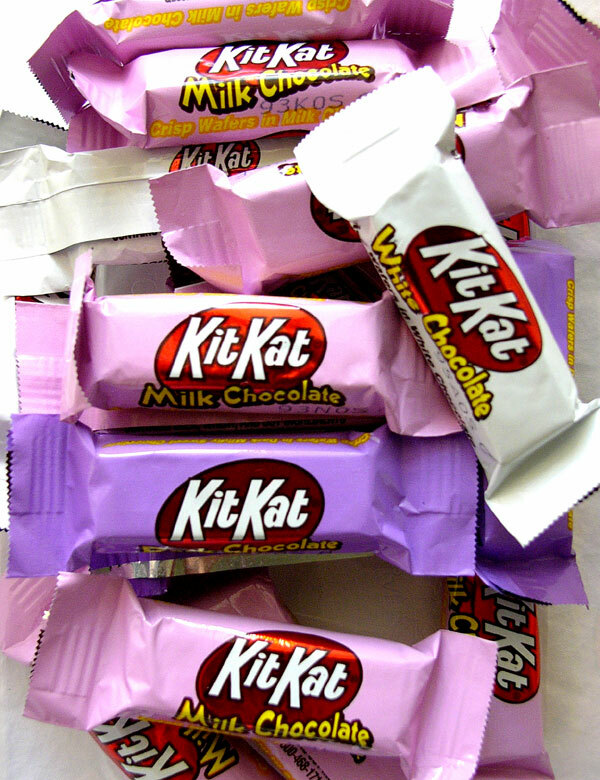 I never dreamed there were so many types of Kit Kats; I've only seen the bland, regular kind. The cappuccino flavor sound great. Sorry I didn't show up at your house on Halloween. I went to Guam and back in a week and went through Japan. 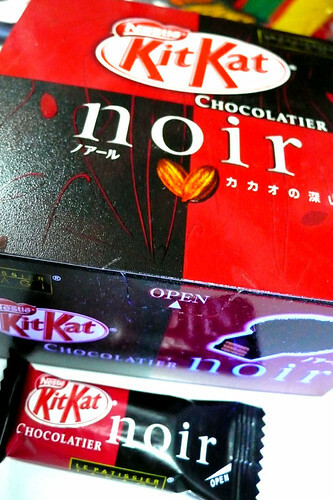 I bought Red Bean Kit Kat and Strawberry Flavours...and then was pleasantly surprised to catch up on your blog and stumble into this one. How appropriate! 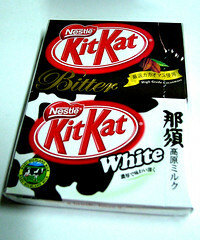 I was bummed I didn't find any White Chocolate KitKat in Narita...the Japanese version is way creamier than ours.